Repairing damage doesn’t haveto lead to dry, brittle hair. 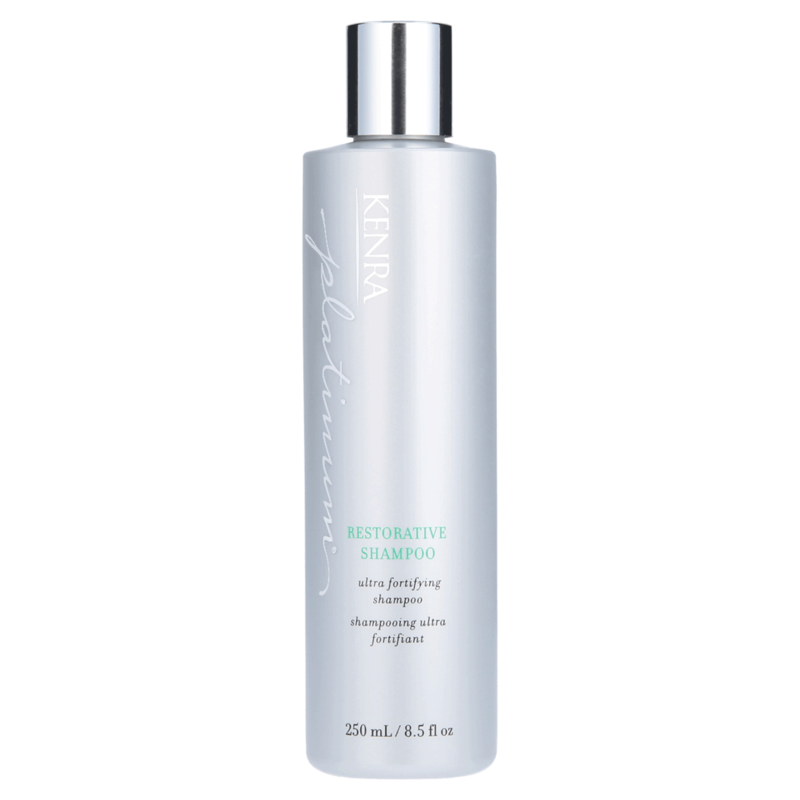 Kenra Platinum Restorative Shampoo targets and deeply penetrates even the most damaged hair cuticles with Keratin Amino Acid technology to restore broken hair bonds from within. Instantly fortify, without over protenizing, to restore smoothness, suppleness & shine. Ultra fortifying to restore damaged hair. Karatin amino acid technology targets and deeply penetrates only damaged hair fibers. Restore smoothness, suppleness, and shine from whithin, without over protenizing. AQUA/WATER/EAU, SODIUM C14-16 OLEFIN SULFONATE, COCAMIDOPROPYL BETAINE,SODIUMMETHYL COCOYL TAURATE, GLYCOL DISTEARATE, FRAGRANCE (PARFUM), COCAMIDE MIPA,PHENOXYETHANOL, BENZYL ALCOHOL, ACRYLATES COPOLYMER, CITRIC ACID, GLYCERIN, GUAR HYDROXYPROPYLTRIMONIUM CHLORIDE, COCOGLUCOSIDES HYDROXYPROPYLTRIMONIUM CHLORIDE, SODIUMLAUROYLGLYCINATE, GLYCERIN, PEG-150 DISTEARATE, PEG-200 HYDROGENATED GLYCERYL PALMATE, CETRIMONIUM CHLORIDE, SODIUM HYDROXIDE, PEG-7 GLYCERYL COCOATE, SODIUM HYDROXIDE, DISODIUMEDTA, POLYQUATERNIUM-7, KERATIN AMINO ACIDS, PANTHENOL, ISOPROPANOLAMINE, SODIUM BENZOATE, PHENOXYETHANOL, SODIUM BENZOATE, PHENOXYETHANOL, CHLORPHENESIN,BENZOIC ACID, SORBIC ACID""